Diet stalls are frustrating. You limit carbs but the scale ignores you. A low carb cheat day may help by shaking up your metabolism. Here’s scientific proof and a plan to do it right. How does cheating help? Your body adapts to physical routines and ways of eating – eventually. Diet progress stalls and we plateau. Cheat days shake things up a bit, metabolically speaking. If you’re not seeing progress on low carb, cheating on your diet can help. To get started, schedule six low carb days, followed by one (wonderful) cheat day. Your low carb cheat day allows extra carbs, preferably in the form of slow carbs: sweet potatoes, beans or nuts – foods allowed after the Atkins Induction phase. If you’re just starting Atkins, a low carb cheat day is generally NOT recommended. Wait a few months, see if your progress slows, then revisit the idea. Low carb cheat days sound counterproductive. Actually, it’s a key to faster fat loss. As our body adapts to routine, leptin levels drop and weight loss slows. Leptin is a hormone that controls metabolism and hunger cravings. After a few weeks of dieting, leptin levels drop and we store more fat. Use a low carb cheat day to outsmart your body. Eating more calories, carbs and fat one day a week raises leptin levels. Raising leptin levels keeps your body primed for rapid fat loss all week. Cheat days boost fat burning and weight loss – but only when you cheat in a sensible way. Budget your calories for what matters most. Track/count the extra carbs you’re eating. Be realistic – don’t go crazy. Don’t go to Duncan Donuts. First, test your carb limits. You may not need a cheat day. If you do, determine your total cheat day calories and start planning. If you’ve adapted to your low carb routine, try dropping your total daily carbs the day before you cheat on your diet. If you average 40 net carbs per day, drop this number to 20 or 30 for a few days and see if the scale starts moving again. If there’s no improvement after one week, plan your low carb cheat day. Are you eating too much? Are you eating too little? Eating too many or too few calories stalls fat-burning. First, find out exactly how many calories your body needs. Calorie calculators find your daily needs according to your age, height and current weight. If your calories are in check and you’ve reached a plateau, jump-start weight loss with a 20 – 40% total calorie increase on your cheat day. A little planning for your low carb cheat day goes a long way. Minimize after-effects by choosing the right cheat day foods. Slow carbs absorb gradually. Slow carbs take longer to digest, keep you fuller for a longer time and don’t cause severe, sudden insulin spikes. Craving something sweet on your low carb cheat? Avoid (or at least limit) processed sugary carbs like cookies, cakes and breads. If you eat a sugary ‘forbidden’ food, at least indulge in healthier choices: cheesecake instead of frosted cinnamon rolls; dark chocolate instead of frosting or hard candy. It’s easy to improve brain function, reduce cholesterol and lose more weight. Eating chocolate? Follow the chocolate rules. When you cheat on your diet, make it delicious. Don’t grab a dozen doughnuts, but do splurge on something worth savoring, such as a wedge of creamy cheesecake. Whatever you love, buy it in its most intense and tasty form. You’ll eat less of it, and still get the flavor you’re craving. Splurge on gourmet sea salt or chunky kosher salt. Sprinkle it over a ripe, red tomato. You’ll have brilliant, bright flavor, a salty hit and better crunch – you’ll use less. On your low carb cheat day, serve meals on a unique or colorful plate with a garnish. Appreciate the eye appeal. Get more satisfaction from your food. Eat slowly, take small bites and enjoy the taste. Create a satisfying, mindful meal experience. Eat foods that go the distance. Healthy, high fat foods with more protein and fiber fill you up, and don’t stimulate your appetite. Try fresh fruit with heavy cream, or sweet potatoes with grass-fed butter. Cheating on your diet affects the rest of your week. Here’s what to look out for and how to cope. After the low carb cheat day, benefits continue for the next 5 to 6 days. Your metabolism efficiently burns fat all week – as long as you go back to your regular low carb diet plan. Low carb cheat days involve more carbs than usual. Excess carbs cause your body to retain water. Don’t worry – the water weight disappears after a 1 to 2 days on your regular low carb diet. TIP: Burn off the extra stored glucose with exercise. It’s almost impossible to be perfect on a low carb diet. Everyone slips up, and that’s fine as long as you don’t let your slip or cheat day turn into a long-term backslide. If you do backslide after your cheat day, learn from it and get right back into your low carb way of eating. Don’t throw in the towel. To Cheat, or Not to Cheat? Are you uncertain about having a low carb cheat day? New low carbers should proceed with caution, as low carb habits are still being formed. Some low carbers say taking a break from their eating plan makes it easier to follow in the long run. Others say low carb cheat days are an open invitation for disaster. Cheat days help me say “No” the rest of the time. I’m doing well sticking to my plan, so I’ve earned it. I just can’t give up (insert favorite food here). Cheat days help me control it. I want to eat more conveniently, like everyone else. I can lose any cheat day weight I’ve put on by reducing my carbs. Since this is a lifestyle and not a diet, there will be times I eat off-plan. Cheating undoes some of the progress you’ve made, although temporarily. Eating too many carbs will knock you out of ketosis, eliminating some of the benefits of low carb dieting. Many people feel bad physically after eating significantly more carbs: bloated, irritable, tired and depressed. Joints ache as inflammation returns for a short while. Eating sugar leads to cravings and binges. ‘A little here and a little there’ quickly adds up. 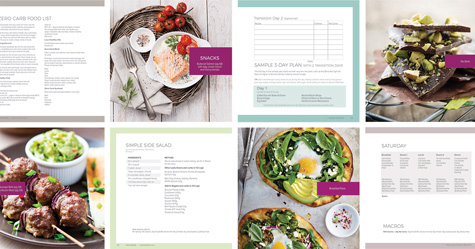 Soon, you’re eating off-plan more and more. If your progress has stalled and you’re thinking of cheating on your diet, count your carbs, find your daily calorie limit and stick to it six days each week. Add one cheat day to your low carb week. Eat healthier, higher carbs and really enjoy the cheat day without going overboard. Clean up any messy after-effects, get back into ketosis, rinse and repeat.